Chicago Vacuum Casting has a reputation as a premier Aluminum Investment Casting foundry. With capabilities of a few grams up to 10 pounds, we produce aluminum investment castings for many diversified industrial markets. A variety of heat treatments are available so that you can be assured of a quality product that will meet or exceed your expectations. Please send your requirements to us and our experienced engineering staff will eliminate manufacturing problems and reduce cost. Our customers trust and depend on Chicago Vacuum Casting for precision aluminum investment castings that are vital to their product lines. 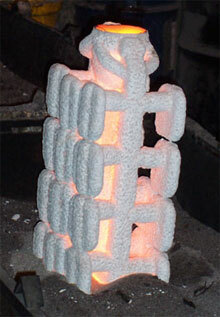 Sand castings, forgings, weldment fabrications are frequently converted to aluminum investment castings to reduce cost. Chicago Vacuum Castings also has the capabilities of offering secondary machining, anodizing/coating, and assembly.